MARAWI CITY, Lanao del Sur, January 16 (PIA) --- Major stakeholders from the government, civil society groups, academe, religious, and the media, here, have joined forces to fight illegal logging in the province. These stakeholders have identified appropriate actions in order to curb illegal logging operations in the province during the recent consultative workshop on illegal logging facilitated by the 103rd Infantry Brigade through the support of the Provincial Government and the Autonomous Region in Muslim Mindanao (ARMM) government. During the workshop, situationers were provided by resource speakers that served as guidelines in the quest for solutions and strategies to completely put to a halt the illegal logging operations. The situationers gave the participants an understanding of the environment and natural resources, how it is managed, what are the laws and regulations that governed its protection and preservation, and the symbiotic relationship between mankind and the environment. Dr. Asnawil G. Ronsing, Mindanao State University (MSU) Shariah Center Director, presented “Islamic and the Environment” which provided a strong and effective framework on environmental stewardship from an Islamic perspective while Forester Ben-Ali B. Decampong, Lanao del Norte PENR Officer, explained the various laws and regulations governing the protection and conservation of forest resources. Further, ARMM Secretary of Environment and Natural Resources Forester Cosain Abbas imparted clear understanding of what are forests and forestlands, the benefits that can be derived from the forests, and the effects of forest denudation. He also presented the state of the forests and forestlands in the province, as well as, the control and supervision over such forest and forestlands. Pipalawan Naga of the Save Lake Lanao Movement (SALLAM) presented the importance of Lake Lanao, and the enabling laws, development interventions and efforts to save to lake while Provincial Police Director Senior Superintendent Romeo Magsalos, shared the zero plastic bag and styrofoam campaign, a program initiated by the Marikina City Police Station as its modest contribution to help the country fight global warming. 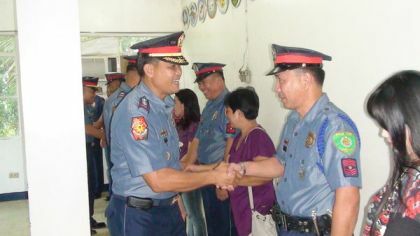 Magsalos was the former chief of police of Marikina City. Dr. Mary Joyce Guinto-Sali of the MSU – Institutional Research and Evaluation Office (IREO), likewise, tackled climate change and its effects on human health, agriculture, plants and animals. She said climate change action will require concerted effort of everyone citing that its adverse effects can be mitigated by controlling releases of greenhouse gases, protecting the remaining forest resources, and planting more trees. On the other hand, Samira Ali-Gutoc, a member of the Philippine Army Multi-Sectoral Advisory Board shared insights on the communication, advocacy and mobilization against illegal logging. Gutoc, who represented ARMM Governor Mujiv Hataman, also gave an update on the memorandum of agreement signed by the ARMM government and the DENR where a P49.6-million worth of assistance was granted by the DENR for the rehabilitation of some 2,500 hectares of forestland within the autonomous region. Meanwhile, among the immediate solutions identified by group include reporting illegal logging activities to the task force, planting and growing of trees, and massive IEC campaign at the grassroots level through the help of tri-media and religious leaders. Other solutions involved strengthening of law enforcement; prosecuting illegal loggers, timber poachers, and possessors of illegal forest products; participation of local government units in the enforcement of laws; and the provision of alternative livelihood to carabao loggers.